The dog's name was originally Kudryavka, or Little Curly, but she became known internationally as Laika, a Russian word for several breeds of dog similar to a husky. American reporters dubbed her Muttnik as a pun on Sputnik. Unfortunately, Laika's trip into space was one-way only. A re-entry strategy could not be worked out in time for the launch. 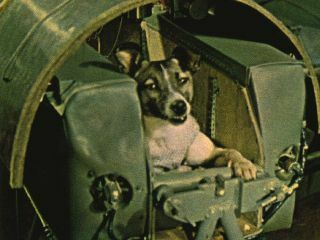 It is unknown exactly how long Laika lived in orbit — perhaps a few hours or a few days — until the power to her life-support system gave out. Sputnik 2 burned up in the upper atmosphere in April 1958. Although there is no distinct boundary between the atmosphere and space, an imaginary line about 68 miles (110 kilometers) from the surface, called the Karman line, is usually where scientists say Earth's atmosphere meets outer space. The first mammal in space was Albert II, a Rhesus monkey. Albert I's mission had been unsuccessful, but the second Albert reached a distance of 83 miles on June 14, 1949. Albert was anesthetized during flight and implanted with sensors to measure his vital signs. Unfortunately, Albert II died upon impact at re-entry. Although the early animal astronauts achieved great fame, many other animals have quietly contributed to the body of scientific knowledge about life in space. As humans have grown more accustomed to space travel, fewer animals make the front-page news. Still, their contributions are important. July 28, 1973: Two garden spiders named Arabella and Anita were used to study how orbiting earth would impact spiders' ability to spin webs. Arabella spun a fairly symmetric web even though the thread thickness varied — something that earthbound spiders don't experience. 2017: Healthy mouse babies arose from mice sperm hosted on the ISS for nearly 300 days in 2013-14, suggesting that sperm for other species could be hosted off-Earth in case of catastrophe. 2016: Twelve male mice were sent to the orbiting complex for 30 days so that researchers could look at changes in the animals’ DNA. 2014: A student experiment sent a colony of ants to the ISS and compared them to other colonies on Earth. The aim was to see how microgravity affects the movements of the space ants as they search for food. 2014: Mice were flown to the ISS to study how long-duration spaceflight affects muscles, nerves, the heart and other systems. 2013: Russia launched the Bion-M1 space capsule for a month in space to study gerbils, geckos, mice and other creatures. Upon landing, officials discovered that half of the mice and all of the gerbils died during the flight due to technical issues in their food supply and shelter. Fruit flies launched in 1947 became the first animals to reach outer space and be recovered alive. See the history of animals in space in this Space.com infographic.